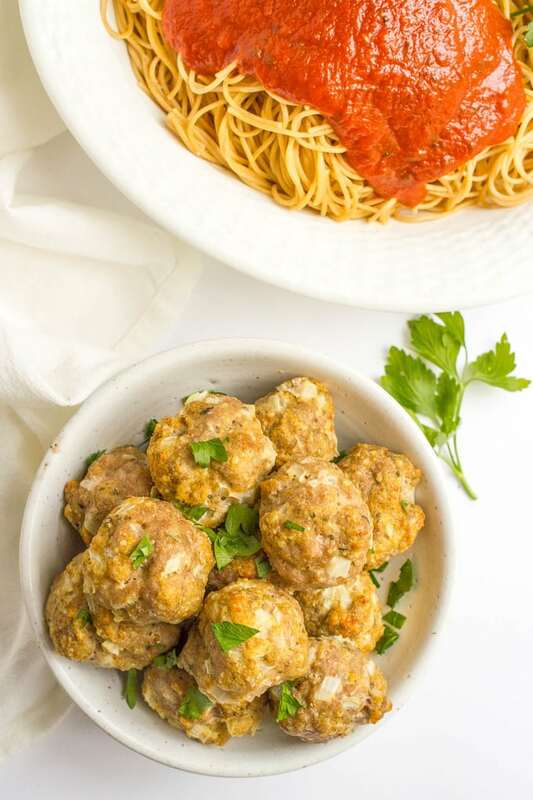 Homemade baked turkey meatballs are perfect for a spaghetti dinner, feeding a crowd or freezing to have on hand for busy nights. And this easy recipe takes just minutes to prep! Hello from the beach! I hope you guys are having as great a week as we are! And not to be short, but I’m ready to get back to it, so without further ado, let’s get to today’s recipe! I’m always tempted to buy frozen meatballs at the store. I can’t tell you how many times I’ve picked up various brands and bags and thought I might cave and buy them. But I can’t not look at the ingredient list. And every time I do, I think, I don’t really want to buy this. I don’t know what all of that stuff is. I’m sure I could make them better and cleaner at home. So finally, I did. It took me a while because I kept thinking they needed to be complicated and involved. Wrong! 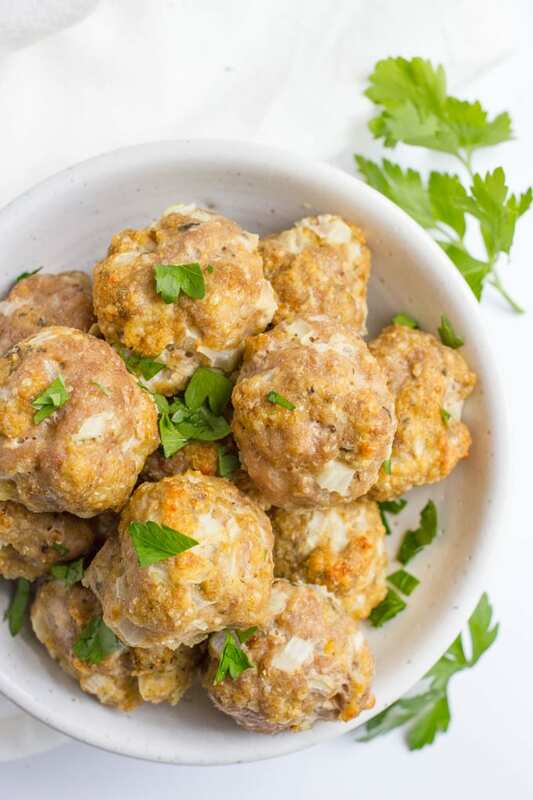 These easy baked turkey meatballs are super basic, with wholesome ingredients, and they couldn’t be easier. And the flavor is crazy good! They are tender and perfectly seasoned and ready to be drenched in sauce and devoured. The store-bought version has nothing on us! 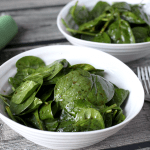 After you get these easy meatballs in the oven, start cooking some spaghetti noodles, throw together a simple spinach salad and you’ll have dinner on the table in no time. I use 93% lean ground turkey but you could substitute lean ground beef if you prefer. You can adjust the seasoning, too, to suit your family’s tastes. Add another clove or two of garlic to emphasize that or some extra red pepper flakes for spicy meatballs. You can increase the cheese to 1/2 cup to make them extra cheesy if you like. There’s lots of ways to use these meatballs too! Don’t just stop at spaghetti! 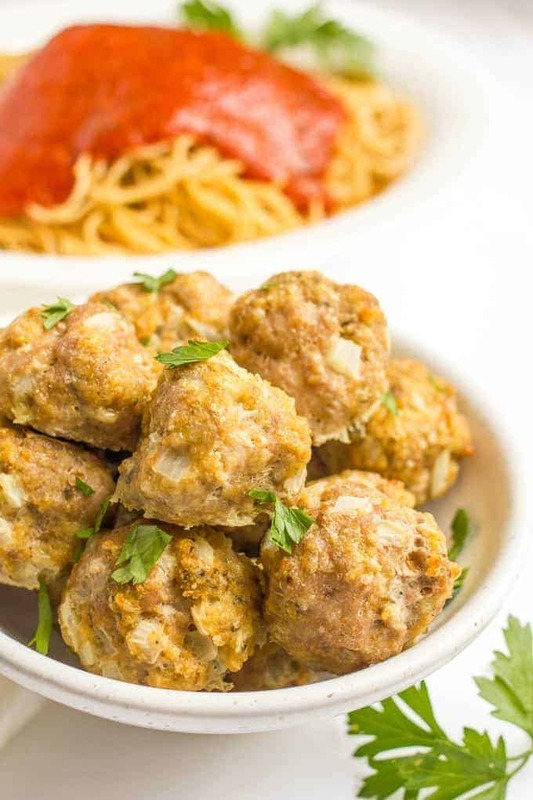 You can also use these baked meatballs for meatball subs, meatball pizzas, appetizers, meatball lasagna, meatball and veggie noodle bowls – anything you like! 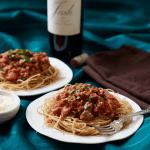 – I cook all of my meatballs before freezing, so then they are ready to reheat and serve. – Once the meatballs are cooked and cooled, you can place them in a freezer ziptop bag or a freezer-safe container. – Label the bag and pop it in the freezer for 5-6 months. – To defrost, it’s best to take the bag out of the freezer and let the meatballs thaw in the refrigerator overnight. 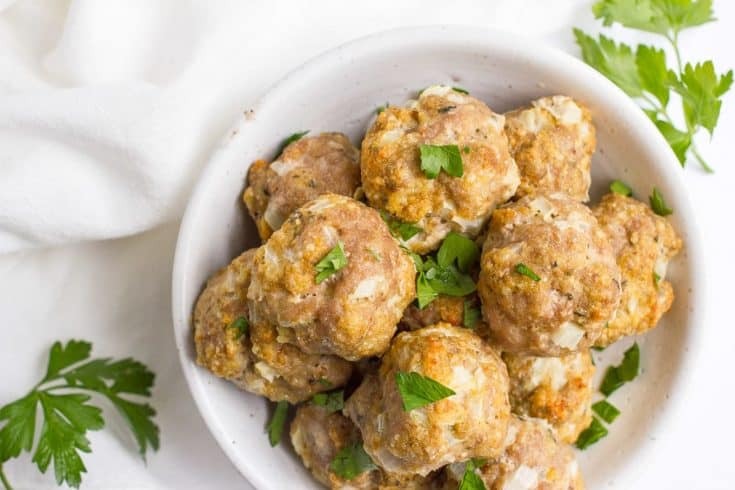 If you’ve been looking for a homemade turkey meatball recipe, I hope you give these a try. You’ll love how easy they are to make, how delicious they are to eat and how perfect they are to freeze for another night. Hope you do, too. Enjoy! P.S. 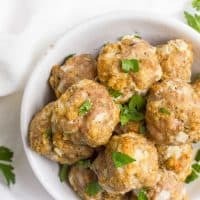 You should check out my cheesy chicken meatballs too! Seriously yummy! 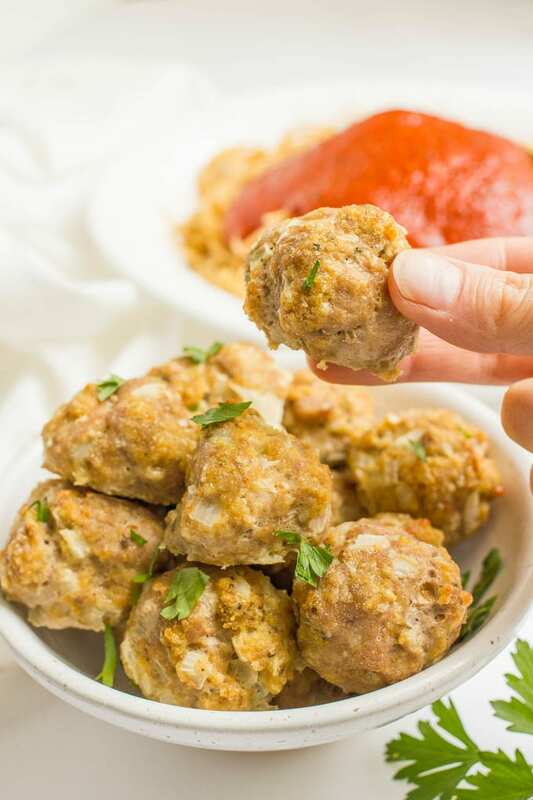 Easy homemade baked turkey meatballs take just minutes to prep! Preheat oven to 400. 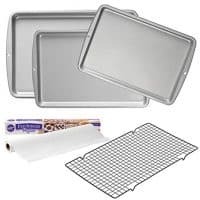 Line a baking sheet with aluminum foil and spray with cooking spray for easy clean-up. Mix all ingredients together in a large bowl until combined. Be careful not to overmix. I usually start with a fork to get things somewhat combined and then use my hands to gently mix it together well. Shape into 1-inch round meatballs and place on prepared baking sheet. 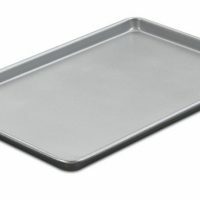 Bake for 20-22 minutes, until done. Serve these meatballs with pasta and marinara sauce, or stuff them into a hoagie for a meatball sub. Or serve them as an appetizer with toothpicks and sauce for dipping. I use the 7% fat ground turkey; it’s lean but still has good flavor. You could also sub lean ground beef here, if you prefer. You can easily double the recipe and bake extra meatballs to freeze. Cool then place the extra baked meatballs in a labeled freezer Ziploc bag and remove excess air before sealing. To reheat, just pop a batch in the microwave. Start with 1 minute then add time in 30-second intervals until they are heated through. 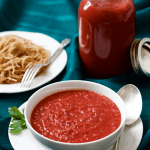 You also can heat them on the stove in a pan as you warm up your marinara sauce. Homemade is definitely always best! Love how easy these are to prep and make. 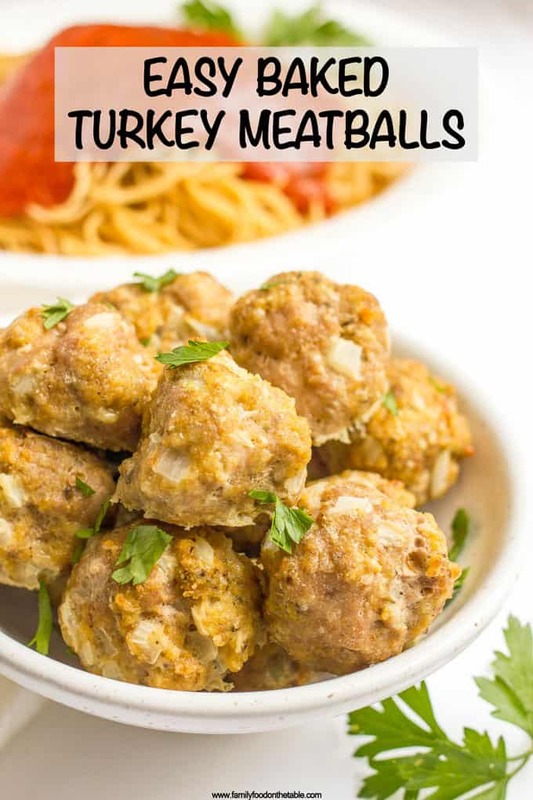 Our fridge is usually always stocked with ground turkey so I’m sure these will be making an appearance soon 🙂 So many possibilities with meatballs and who doesn’t love them, right? Happy you guys are having a lovely time at the beach!! Enjoy! 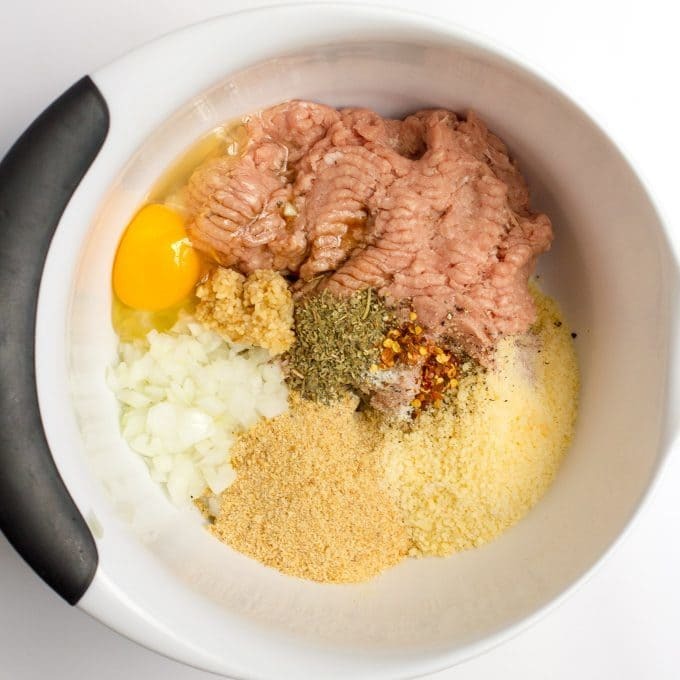 I almost bought some ground chicken for meatballs last week…but I didn;t :/ I’ll fix that with tomorrow grocery run! You won’t be sorry Rebecca 🙂 They’re so great to have on hand! So jealous of all of your beach fun! Homemade meatballs are always delicious but sometimes on busy nights, there is just not enough time. I love how these can be frozen and the fact that they are healthier! Oh I am so jealous! I would love to be close to the beach instead of the muddy Missouri river. I’m with you on those darned labels. I can’t buy convenience either when I know the garbage and preservatives in the product. These meatballs look delicious! Perfect for an appetizer or a meal. Enjoy your beach time! I just made these, Loosely following the recipe and using fresh herbs from my herb pot. 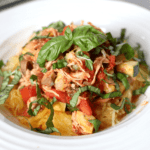 One of the best meals I have ever had was spaghetti squash with meatballs and pesto and I plan to freeze these meatballs and make that for lunches at work. I noticed the meatballs flattened out, as mine always seem to do. Is there any way to keep them round? Hi Claire! I’m so glad you enjoyed these! The ones I make in the recipe above flatten a bit on the bottom, where they are sitting on the pan, but otherwise stay pretty plump and round, like I roll them as I’m placing them on the baking sheet, so I’m not sure why yours fall. I made your turkey meatballs and they were delicious. I also used a salad shooter gadget to grate the onion and cut the time in half. Also I baked your meatballs on 400 degrees but got a little burnt? Should I lower the temperature to 375 degrees instead and cook the same time 20-22 minutes? Hi there! I’m so glad you enjoyed these meatballs! Mine always work great at 400 but ovens can certainly vary. Yes, I’d try baking them at 375 next time and check them at 20-22 minutes. They may need to cook a few extra minutes at that lower temperature to make sure they get cooked through. Looking forward to making these! Any idea what consistence would be like I omit the cheese and use ground oats instead of the breadcrumb? Hi Nikki! I’ve never made them like that so I’m not sure. I think the oats would work fine as a substitute for breadcrumbs, but don’t know about the taste and texture without the cheese. Would love to hear if you try it! How many meatballs are a serving size it doesn’t day. Hi Laura! The serving size is sort-of up to you… I usually have 3 but my husband eats 4-5. My kids (who are young) can chow down 3-4 themselves – they love them! Oh, and the nutrition info is calculated for a single meatball, in case that helps you. I followed the recipe exactly, but ended up with 37 meatballs and they are definitely a bit larger than 1″. I can’t wait to taste them!! I hope you enjoy them Debbie! 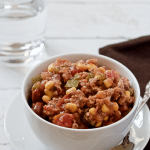 Easy, delicious family comfort food! Yes! It’s a regular go-to in our house! These would be a hit at my house! 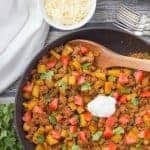 Ground turkey is a staple for me, so I love that I already have all the ingredients on hand! They are a regular go-to for us!